Ministries - Loving God & serving others! We seek to preach and teach the whole council of God as given to the English speaking people in God's church, using the King James Bible. Pastor Tim and staff are diligent to not add anything to the message of God's Word. We seek no new revelation as we study and proclaim His truth. Our goals include reaching the lost world with the gospel of Christ, grounding God's people in the doctrines of the Baptist faith, and developing disciples that will be able to faithfully teach others the same. We hope you enjoy the preaching and teaching of God's Word here at Rose Hill. For sermons preached here, go to our podcast page. We seek to provide every member of your family with appropriate Bible teaching on each members level. From teenagers, to elementary, to adult classes, we are sure that you will be comfortable learning the truths of God's Word in one of our Sunday School classes. Our teachers are well studied in the Word of God and warmly expound His truths on the level of each member. Join us at 10 am each Sunday for class! We seek to honor God with our voices and song. We encourage people of all ages to participate in this area of service, teaching and training our young people in the acceptable practices of music in the church. We know that the Lord must be our first audience in our singing and seek to please Him above all else. We also know that the Holy Spirit can be moved when God's people lift their voices in song, and want this above all else. Proper music will encourage the hearts of the listener and will prepare us all for hearing the truths of God's Word from the pulpit. On Wednesday nights at 6:30 pm we are engaged in Bible study and prayer. We believe in keeping the Word of God first and foremost in our lives, which is essential to growing in our relationship with God. This relationship goes two ways when we pray. Therefore we encourage old fashioned prayer in this service as well. At the close of our song service each Sunday morning, our children are offered a time of teaching and life application in a separate program. They learn bible verses, do bible activities, and study God's Word on their own level. This allows them a chance to learn, but also lets parents know that they are important to this ministry as well. 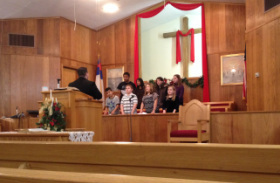 This same group is also encouraged to sing in our children's choir and has the opportunity to minister in plays and programs throughout the year. 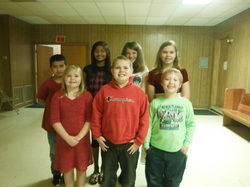 Our children meet at 6:30 pm, every Wednesday for a special time of fellowship that we call Light Brigade. 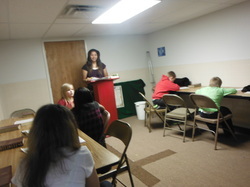 All kids from age 3 up to those in the 7th grade are encouraged and aided in Bible memorization and study. They have a time of fun and games with a snack and of course their own Bible lesson to help them grow in Christ. This time has been greatly enjoyed and our kids are learning how to be good soldiers in Christ. Through the memorizing of Scripture, they are given opportunity to "move up" in rank and earn special prizes. All glory is given to our Chief Commander the Lord Jesus Christ as we are able to grow in our Christian life.